-The microphone body contains two separate amplifier circuits; the output of each capsule is of course available separately via an XLR3M jack on the external power supply. -The polar patterns of the SM 69 fet are selected via “remote control,” on an external power supply/switchbox such as Neumann’s NS 69 (or NS 69 i). This allows the microphone to be used in “installed” applications while retaining the ability to change polar patterns. On the USM69, the pattern control switches are on the mic body, and there is no need for an external hardware device. The SM 69 fet used a 12-pin Tuchel connector. 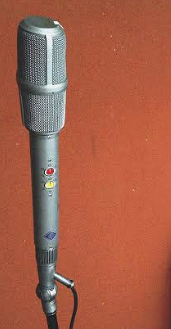 The USM 69 uses a 5-pin XLR (XLR5M) connector. The two capsules of the SM 69 fet provided 9 polar patterns apiece. The SM 69 fet had higher sensitivity (19 mV/Pa vs. 13 mV/Pa). The SM 69 fet has less headroom; its max SPL is 123dB (vs. 132dB).